So I'm planning to make a charger that can charge multiple lithium batteries in parallel with hope to use recycled one. I fully understand that they are dangerous when you do it incorrectly, so I just want to make sure first. I can individually address the batteries by opening and closing the MOSFETs. My question is how can I charge the batteries as quickly as possible. I can just charge one at a time and discharge 1 at a time, but that seems inefficient. My plan is to charge all the battery individually until the voltage meter reach 4.2V (The battery voltage can be like 3.9 or 4.1, but the charger keeps it at 4.2). Once all of them allow the charger to stay at 4.2V, open up all of the gates and charge all the battery in parallel. This is the part that I'm unsure. Since the voltage of the charger will remain at 4.2V, this shouldn't be a problem right? In case the charger got disconnect, all of the gates will close to isolate the battery. The Arduino will then read each of the voltage of the batteries by open the corresponding gates, finding batteries that are at 4.2V and open those gate to discharge. This would also won't cause a problem right? The Voltage you want to measure is the open circuit voltage (OCV), which is the voltage of the battery, when no current is flowing trough it. So you would need to disconnect the charger to measure the exact OCV. 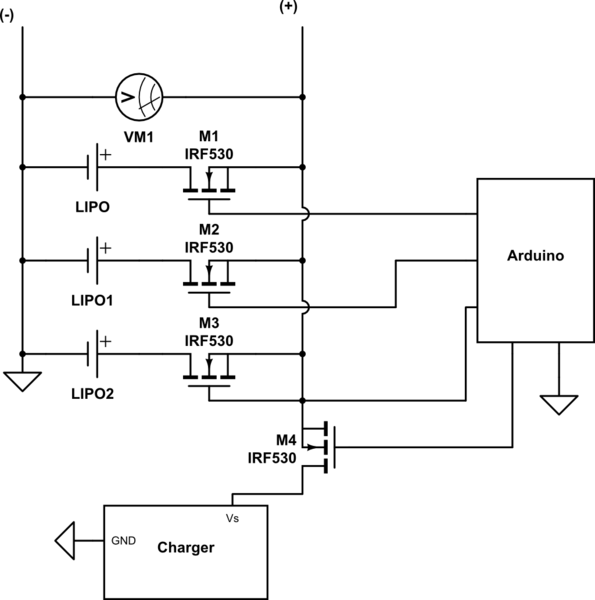 The OCV is then related to the state of charge (SOC) according to the graph in the datasheet. Charging the cells in parallel is an easy method to balance the cells, but as ddurgin said, your current limit influences the charge time. If your charger is set to charge at 1A and you charge 4 cells in parallel, this will result in .25A per cell (on average), so it would take four times as long. Not the answer you're looking for? Browse other questions tagged arduino mosfet battery-charging lithium-ion or ask your own question.